Bhanu Chander works as a STEM trainer for a Robotics company in Hyderabad. He and few of his friends wanted to help children in nearby slums get education. 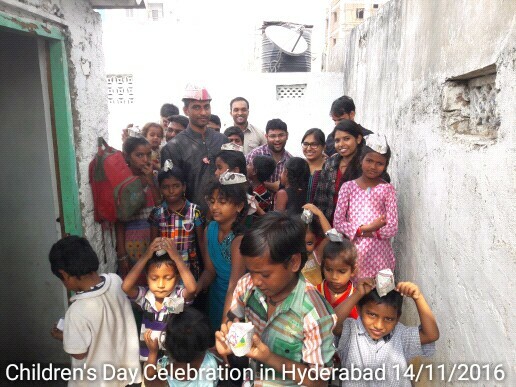 They visited the slums and interacted with parents and kids to understand reasons for children not attending schools. Apart from financial constraints, it was also observed that many parents did not know about local schools and their admission procedures. The volunteers approached a residential school and helped five children get admission. However, the children did not continue due to various reasons, fear and insecurity of the parents being major reasons. Accepting the failure of their first attempt, the volunteers then tried to get these children enrolled in nearby government schools. Most of the children belong to labourer families who have migrated from other states and cities to Hyderabad. Obviously, the children do not understand the local language - Telugu. 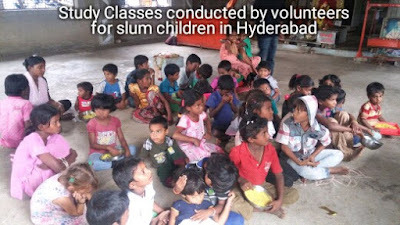 The government school teachers informed volunteers that the children need to know at least basics of the Telugu language, if they want to attend the school. Stuck in this situation, Bhanu started looking for help and came across Door Step School's programmes for migrant workers' children. In the month of October 2016, Bhanu wrote to us about his experience and plans about the children. His friends had already decided to start teaching the children on weekends, but they were clueless about how and where to start. During next one month, we had numerous interactions through e-mail, phone calls, and WhatsApp. 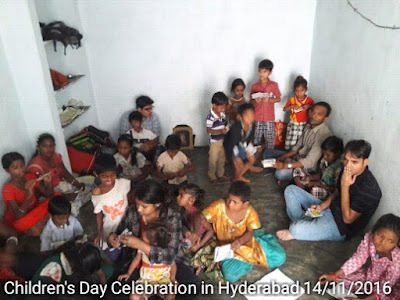 We discussed various options like involving a local NGO from Hyderabad, conducting the study class in nearby school, building rapport with the parents, etc. The volunteers have now started their weekend classes in the slum. They are introducing Telugu, English, and basics of Mathematics to the children between 5 and 14 years age group. Around 20-25 children attend these classes conducted by volunteers on Sarurdays and Sundays. They keep a track of what is being taught in each session, so that they can plan further sessions with same or different volunteers as per their availability. Door Step School has a reading skill development kit already prepared and being used for Marathi language. We are trying to replicate a similar teaching module for Telugu. We are also working out how English and numeracy skills can be taught to these children with help of simple teaching tools and workbooks. 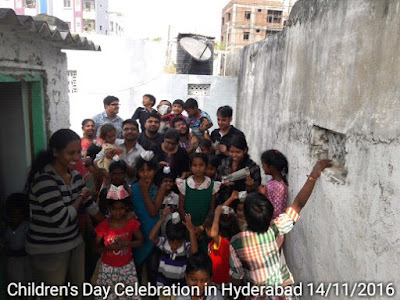 The volunteers recently celebrated Children's Day in the slum. Parents have started responding positively and are happy to see their children learning something new every week. The volunteers are very much determined to bring these children into mainstream of education by start of next academic year. The Every Child Counts campaign was launched by Door Step School in 2011, with a vision of involving concerned citizens in education of out-of-school children, making it an organic and sustainable model of community development. Bhanu and his friends from Hyderabad are setting a wonderful example of how citizens can contribute towards the larger goal of 'Education For All'.